Home Case Studies Dexter G.
I took Dexter in as a stray when he was 6 months old. He was infested with ear mites, but otherwise healthy. He had to be kept separated from my other cat, because at that time treatment consisted of drops in his ears 3 times a day and he was considered contagious. It took about 4 months to get his ears healthy. He was fed mostly Purina dry food. He remained healthy until spring of 1999, when he developed a urinary blockage. He was catheterized and in the hospital for 3 days. He was on pain medication and antibiotics, was prescribed Purina U/R canned/dry, and after refusing to eat it, was switched to Hill’s c/d. He weighed 14.5 pounds, his fur was thick and soft, and he received many compliments on his beautiful coat. By fall of 2003, he had licked his belly bald. Skin biopsies were taken and inconclusive. He was then started on Depo-Medrol injections. By spring of 2004, he was having episodes of vomiting and had lost weight. His underside was still bald and he had scabs on his back legs. It was suspected to be food allergies and he was prescribed Hill’s z/d and later switched to Royal Canin HA. In October 2004, his skin was worse and he was prescribed prednisolone and two months later chlorpheniramine was added. For the next four years, Dexter had many episodes of vomiting and diarrhea. He remained a very sweet boy, and enjoyed mutual grooming with my other cats and loved human attention. In spring of 2008, he was over grooming, chewing his feet, and vocalizing excessively. He was on metronidazole and FortiFlora because he had pale, bulky, foul smelling stools. He was eating Iams Low Residue, prednisolone was increased to 5 mg 2x daily and he was started on B12 injections .5 cc every 2-3 weeks. He was also on Cosequin and Orbax. He continued to have diarrhea and weight loss, was always hungry, and smacked his lips. I thought he was hyperthyroid as he had many of the symptoms. His thyroid test was normal and he was de-wormed in case he had parasites. In July 2008, Dexter remained constantly hungry, had nausea, and was drinking more. His stools were soft, pale and odorous. He was eating Hill’s w/d dry and Fancy Feast canned. We were concerned he may have cancer. He had an echocardiogram/ultrasound and fine needle aspirates were taken. He was also tested for pancreatitis and bartonella. He was diagnosed with chronic pancreatitis, suspected IBD and triaditis. He continued to have diarrhea and was prescribed Zenequin and Pancrezyme. He was switched to a hypoallergenic diet, Royal Canin HA and Hill’s z/d. After three weeks he was no longer interested in the prescription food and was fed whatever I could get him to eat. He seemed depressed and cried when I picked him up. In January 2009 Dexter would often sit hunched up in his bed and looked uncomfortable, especially after he ate. He was vomiting often and had pudding like stools. His prednisolone was increased to 5 mg daily for 7 days, then back to 2.5 mg daily. When his prednisolone dose was lowered, he had diarrhea; when it was increased, he sneezed and had watery eyes. For the next few months he continued to have episodes of vomiting and diarrhea. He was taking cyproheptadine, metronidazole, tramadol and prednisolone. In spring of 2009, Dexter turned 16 years old and had a geriatric exam. He was diagnosed with cataracts in both eyes and his left thyroid gland was enlarged. Labs were normal (except for dilute urine). He was still having episodes of vomiting and diarrhea and I was concerned for his overall health. Since he responded so well to prednisolone, it was increased to 5 mg daily, and when his stool was normal for 3-4 weeks, decreased to 2.5 mg daily. He was also getting B12 injection .25 mg and started Pepcid AC 10 mg – 1/4 tablet up to 2x daily for vomiting. In July of 2009, his coat was thin and his ears would curl over. He was diagnosed with pinnal alopecia on both ears. At this point, it was apparent the long-term steroid use was taking a toll on his body. For the next 6 months Dexter continued to have bouts of vomiting and diarrhea. He vocalized excessively and slept hunched up on his stomach with his head stretched out. He refused to eat prescription food and was fed Fancy Feast, Friskies and ProPlan pate varieties. He later stopped eating and was prescribed mirtazapine, which made him agitated and restless. It was discontinued and he was prescribed cyproheptadine. He was also getting buprenorphine for pain, which caused a strong opioid reaction (dilated pupils, staring off into space). I didn’t want him in pain so I kept reducing the dose hoping to get him comfortable. In December 2009 he was diagnosed with alopecia secondary to chronic prednisolone administration. By this time I had made many attempts to wean him off prednisolone, but his stools became watery, his appetite dropped and he looked miserable, so I would increase the dose again. 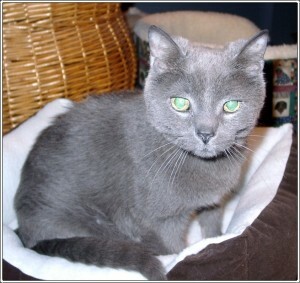 In January 2010 he had runny eyes and was sneezing, which spread to four other cats. All five cats were put on doxycycline and Terramycin eye ointment for 3 weeks. Three of the cats had an adverse reaction to the eye ointment, so it was discontinued. It was thought to be possible herpes virus, all cats were started on L-lysine. Dexter’s immune system was compromised – possibly from steroid use, or being chronically ill for so many years. In spring of 2010 Dexter again looked painful, sitting hunched with his back arched, paws gathered under his body, and nose resting on the floor. His mouth bothered him and he would stick his tongue out. He continued to have episodes of vomiting – treated with injections of Cerenia, 150 cc fluids, and MiraLAX. ProZyme was started and Pancrezyme was discontinued, as I didn’t think it was helping. X-rays were taken to rule out an obstruction. His colon had a mixture of “foamy looking” gas and stool, and it was determined to be another bout of pancreatitis and gastritis. He was eating Wellness canned and was changed to Royal Canin LID. In October 2010 Dexter still sat hunched up and looked miserable. He was constantly hungry, but would only eat 1/2 oz of food at a time. He had been waking me up every night for a couple of years, demanding food. If I confined him with food, he became anxious and vomited. I took him to another clinic and he was referred out for an ultrasound (no new information was learned). He was then prescribed amitriptyline. He finally seemed comfortable, slept through the night, and started gaining weight. This was the best he felt in many years. In January 2011 he was still drinking a lot, vomiting, and his stools were light colored and frothy. He had been taking Cerenia and famotidine, but it didn’t seem to help. I again brought him in for an exam as it seemed a vicious cycle and I wanted him to have a better quality of life. He had a lesion in his mouth, and would have benefited from a dental cleaning. We decided to watch it, as having a dental seemed too risky. He was prescribed Viokase-V to help firm up his stool. He refused to eat it mixed in food, and vomited if I syringed it down him. He was eating Wellness, Evo, By Nature canned, and Blue Wilderness dry. In May 2011, Dexter was again experiencing vomiting, diarrhea, and had been pawing at his mouth. His labs showed stage 2 chronic renal disease. He was 18 years old and was thought to have both oral and gastrointestinal/pancreatic disease. We were told he was at a high risk for anesthetic complication, due to his age, heart murmur, and illness. We were offered a referral to an oncologist, but because he was getting weaker and more confused, decided against it. Instead, I gave him clindamycin 25 mg for two weeks and no longer offered him dry food. His mouth issues subsided. 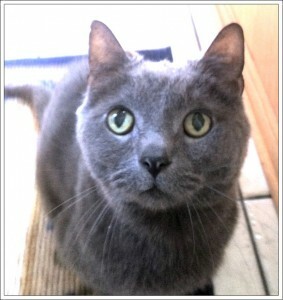 By November 2011, Dexter had a ravenous appetite, was restless, unsettled, and losing weight. He would vomit his medication for days in a row, especially if it was given with a meal. He medications were: amitriptyline, Dasuquin, Cerenia, Tumil-K gel, prednisolone, famotidine, and B12 injections every other week. On exam he had a gallop rhythm, heart murmur, anemia, hypokalemia, and his right thyroid gland was enlarged. His thyroid level was checked again and was in the normal range. I wasn’t sure how much longer he could continue, as we were running out of options to help him. In December 2011, he was started on a trial of methimazole 2.5 mg daily. He finally stopped vomiting and had a more relaxed attitude. Keeping his medications and food down, he felt better and started to gain weight. In spring of 2012, Dexter is 19 years old. He is very active and demands frequent feedings and attention. He fluctuates between having constipation and diarrhea, and still sits hunched up in his bed for a while after eating. His fur is softer and thicker since adding a fish oil capsule. I am currently giving him 100 mls fluids every other day. He weighs 9.4 pounds, which is more than he’s been in a year. I order his medications online, as it saves time and money. I put multiple medications in a capsule to reduce pilling, and he is given a treat afterward. He is fed small amounts every 2-3 hours throughout the day, and his diet is changed frequently to keep him eating. He is confined at night, as he gets stressed and vomits liquid if he doesn’t get food frequently. He is currently eating Felidae, Fancy Feast, Wellness, baked chicken, and meat baby food. Following are his current medications. August 23, 2012: Dexter has done well all summer and spent more time relaxing in the sun than he has in years. His stools are usually formed and he seems comfortable. He is eating mostly Fancy Feast pate and Freshpet Vital. He still likes to eat every couple of hours throughout the day, and has food available in his room at night. We took him to a new vet for an exam and labs. All his chemistry parameters were normal with the exception of a mild elevation of his BUN at 39 (normal 18-36). His CBC was normal with the exception of his PCV just below normal at 26.9% (normal 28-47). His thyroid function test was 1.2 (normal 1.9-4.8). Blood pressure, urine concentration and culture were all normal. His body condition score was ideal at 5, and he was said to have a beautiful coat and moderate dental disease. I may lower his methimazole dose slightly as he’s lost .5 pounds in three months. I’m very thankful Dexter is doing so well. box every 2-3 hours during the daytime. I am concerned because his legs slide out from under him when he walks on a smooth surface and he sometimes seems lost. The vet doesn’t think Dexter is in any pain and is doing well considering he’s almost 20 years old. He can still jump up on the couch and wants petting and lap time. He is eating Natural Plant Organics Turkey canned and Freshpet Vital. I continue to try enzymes, probiotics, Viokase, and slippery elm, but nothing seems to control his diarrhea. This time of year Dexter also has a flare-up of URI, so I am giving him L-Lysine. I had a spine injury a few months ago and have limited use of my left arm. It has been very difficult to keep up with Dexter’s constant care. My cat Sigmund (also listed on this website) is also chronically ill and there were a few weeks before I was put on pain medicine that I wasn’t sure I could care for them any longer. I used to keep them in separate rooms at night and for their daily feedings, but now keep them together so I only have one room to clean. I have three large litter boxes in the room and some mornings the boxes are overflowing with diarrhea and large clumps of urine. Their beds and the floor are often covered with feces, as well as both cats needing a bath. I don’t have as much control over how much each one is eating, but I think they like each others company. They have multiple heated beds and seem content. February 15, 2013: Dexter had been doing very well for a couple of months. His urine issue had resolved and he no longer had diarrhea. He was eating Stella & Chewy’s freeze-dried turkey or duck. Unfortunately his appetite for that only lasted a couple weeks. I then switched him to Freshpet Vital as this is what he ate with gusto. If supplements are added, I mix in a small amount of water and stir. I top it off with Nature’s Variety Instinct Raw Daily Boost Powder (turkey or lamb) and he eats it well. I offer him a grain-free canned food twice a day, but he usually just licks it. One day I noticed a small brown spot on the outer edge of his left eye. We decided to monitor it, as it didn’t seem to bother him and vet appointments have become very stressful for him. Five days later there was still no change. That afternoon Dexter jumped up on the couch next to me and as soon as I looked at him, I could tell something was wrong with his left eye. After a closer look, I could tell blood was pooling in the bottom quarter of his eye. I immediately called his vet. They didn’t have an opening for two hours, and said as long as it didn’t get worse it was okay to wait. I was very concerned and impatiently waited. At his exam his vet said he had a 7-8 mm growth in the iris, and there was blood in the anterior chamber. The pressures in both eyes were normal and a fluorescein stain showed no sign of corneal abrasion. We were referred to a specialist at the UW Veterinary School and had an appointment for the following morning. That evening, Dexter had blood bubbling from his right nostril. It cleared up within the hour. This had never happened before and I was very fearful the end was near. The last thing I wanted to do was to take Dexter for a half hour car ride and put him through a stressful exam. However, I needed more information to find out if it was painful and what to expect. I was told not to feed him after 10 PM that night. Dexter eats every 2-4 hours and has food available most of the night. He vomits if he is not fed this frequently. I was hoping to not have him anesthetized, and decided to feed him a small amount early in the morning. At Dexter’s appointment the following tests were done: blood work, urinalysis – including UPC (protein to creatinine ratio), chest x-rays, blood pressure, blood clotting test, ocular ultrasound (including other eye tests). He was diagnosed with a uveal mass, hypertensive retinopathy, hypertension, and stage 3 chronic renal disease. He was prescribed prednisone acetate 1% – one drop in his left eye 3x daily, and for his high blood pressure, amlodipine 2.5 mg – 1/4 tablet daily. Dexter did surprisingly well during the 3-hour long appointment. At times it was difficult for me to watch as they repeatedly shone bright lights in his eyes and ran a probe over his eyeballs. His eyes were numbed, so he apparently felt very little. I was ready to stop the appointment at any time if I thought it was too much for him. They gave him frequent breaks, and I brought his food with so he could have a snack. His bladder was full when we left home, so I requested a litter box as soon as we got there. He refused to use it and lost control of his bladder while they were drawing his blood. After all this, we still don’t know the extent of his eye issue. I was told the mass in his eye is not a typical presentation seen in cats, as the raised iris lesion is a cystic mass (hypoechoic in the center), indicating there is fluid in the center of the mass and it is not solid tissue. It’s possible that the mass is a hematoma (bruise) or a serous fluid cyst. I was told both of these conditions are extremely rare in cats. We were given two options for how to proceed. 1. Monitor the eye and photo document any changes over time. If the areas of pigmentation are rapidly enlarging, then removal of the eye may be warranted. If he develops glaucoma, uncontrollable bleeding or uveitis, it is recommended to surgically remove the eye. 2. Remove his eye to obtain a definitive diagnosis and prevent possible spread of cancer. The risk of waiting to do surgery is that he may have a cancerous condition that can spread to other organs. Dexter has retinal lesions consistent with hypertensive retinopathy, however, they cannot tie in the bleeding in the front part of his eye and iris pigment change. No explanation of his nosebleed was found. He also had blood in his urine, an elevated UPC, and his blood work shows an infection is present. He has a follow up appointment next week to further assess his issues. March 6, 2013: Dexter had his blood pressure and eye rechecked on February 22. His eye was much improved with the blood resolving well, and the inflammation inside his eye had resolved. His eye drops were reduced to twice daily. However, his blood pressure was slightly higher than before, so he was started on enalapril 5 mg – 1/2 tablet 2x daily. On March 1, I took him back to his regular vet to have his blood pressure checked. It was finally in the normal range (96 instead of 190). His eye drops were reduced to once daily. He also had his thyroid and urine rechecked. His thyroid was low, so his methimazole was reduced to 1/4 tablet daily. His urine had an increased number of white blood cells, and was sent for a culture. The culture was negative so we still don’t know the cause. He still makes frequent unproductive trips in and out the litter box. He’s been doing this for years, so I assume it’s a mental issue. Dexter’s vet said he may have hyperaldosteronism. It’s a rare disorder where the adrenal glands overproduce a hormone called aldosterone. He has the following clinical signs: potassium depletion, high sodium concentration, and systemic arterial hypertension. He also has muscle weakness, plantigrade stance of the hindlimbs, difficulty raising his head, and an episode of hyphema (bleeding in the eye). His vet said diagnosing it wouldn’t change the treatment, as we are already treating everything that we can. I’ve decided to take Dexter back to his regular vet for hopefully the rest of his care. The car ride (with his always full bladder), and multiple vets examining him was stressful for both of us. I feel his vet is very knowledgeable and can provide him with excellent care. He is currently congested with clear liquid occasionally draining from his nose. Despite this, his appetite is good. He is awake most of the day unless I confine him in a room. I’m spending a lot of quality time with him. March 17, 2013: Dexter became so congested that he barely ate or drank for three days. I didn’t want to give up on him, but I was afraid for the worst. I could hear him trying to breath, as it was difficult for him to get air in and out. To help clear his sinuses, I used a steamer with a towel draped over it, holding his head underneath. After about a minute, I could hear the congestion clearing and he was able to breath easier. I did this a couple times a day for three days. I also started giving him 100 mls fluids and Cerenia daily. His appetite gradually improved, but he was only eating baby food and fish based canned food. On March 14, he had a vet appointment to recheck his eye. I was more worried about his general health than his eye. The mass in his left eye was smaller and brown. It was 3.5 mm, lacey and you could see through parts of it. There was a small amount of yellow discharge. His eye drops were tapered to every other day for two weeks, and then discontinued. I was recommended to increase fluids to 200 mls daily if he’s not eating or drinking well. He was prescribed Neo-Poly-Dex eye drops, one drop in each nostril twice daily until three days after sneezing and congestion have resolved. My vet said this can be very helpful instead of giving oral antibiotics. Three days after his appointment, Dexter’s appetite is almost back to normal and his congestion is improving. March 24, 2013: On March 21, Dexter was limping on his right front leg and was hesitant to walk. I took him to his vet to have it checked. There was a hyperkeratotic lesion that was loose with pink tissue beneath, it was removed and Neosporin was applied. His right carpus was mildly swollen. The vet did not think the lesion was the main cause of the limp, and that is was more likely from trauma, arthritis, or cancer. I declined to do any more testing on his frail body. We increased his prednisolone dose from 2.5 mg every other day to 2.5 – 5.0 mg daily. Because a higher dose of prednisolone causes him to have URI symptoms, he was also started on famciclovir 125 mg, 1/4 tablet 2x daily. I was to apply Neosporin to his paw pad 3x daily. On March 24 he is still having difficulty walking, but is able to get to a litter box and water fountain, and still climbs the stairs. I often carry him to his destination because it hurts to watch him. I also noticed his stomach looks bloated and feels hard. He’s still eating but I know the end is near.